A "dislike" button at last? 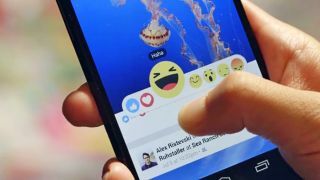 When words just aren't enough - or you just don't have enough time to tap them out - emojis can come to the rescue, and Facebook is reportedly testing out a feature that lets you reply to messages with smiles, sad faces, and even a thumbs down icon. After a reader tip, Facebook confirmed to TechCrunch that emoji reactions are indeed being trialled. Most of the reactions are the same as the ones you'll know from your News Feed, except for that thumbs down, "dislike" button, which Facebook says is more of a "no" response to something that's been said. "We're always testing ways to make Messenger more fun and engaging," Facebook told TechCrunch. "This is a small test where we enable people to share an emoji that best represents their feelings on a message." As with any experiment on the social network, this won't appear for everyone until Facebook is sure it works and has got enough positive feedback from testers. It would however make conversations that bit easier to follow, because reactions can be pinned to individual messages inside a thread. If that sounds familiar it's because there's a pretty much identical feature available in business messaging tool Slack. Whenever Facebook runs out of ideas of its own it's never afraid to borrow a few from its competitors. Facebook officially introduced reactions to the News Feed near the end of 2015 to add more variety to the Like button, and it makes sense to have them inside Messenger too, together with instant responses for yes and no. Keep your eyes on the apps on your own phone for a wider roll-out.